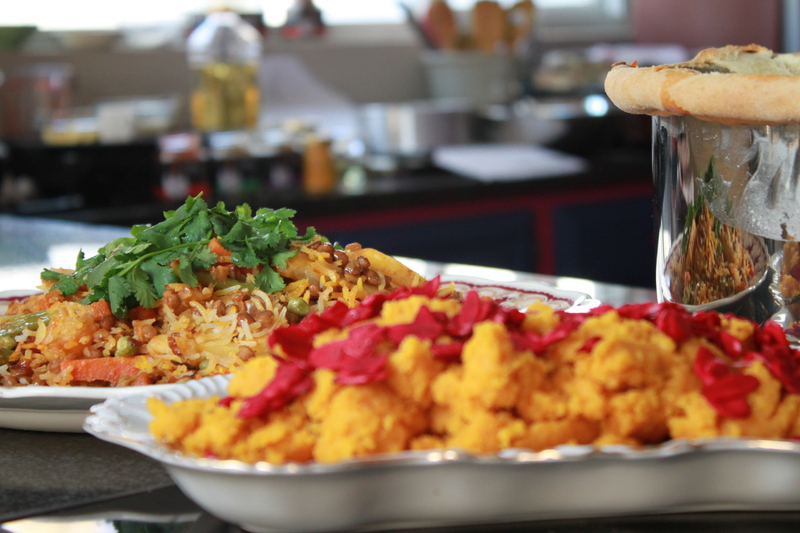 The bold and the breyani….Coming up on Mela! The breyani police will be out in full force on Diwali. The breyani police could be anyone…difficult kids to your dragon in-laws or especially a battle-axe mother in law…for some homes there will be a vegetarian breyani but I am sure that by now you know that I will be enjoying a non vegetarian feast! My mother in law doesn’t visit or eat curry! I am not sure if this is a good thing….perhaps it is just one of ‘those things’! 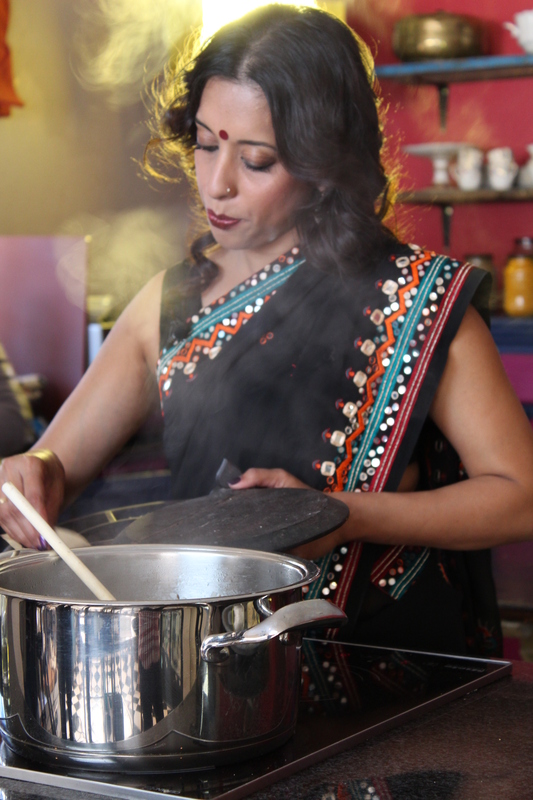 If you are looking for a festive lamb breyani, try out this recipe from my show, Feast of Eid on Saffron/Home Channel last year, https://yudhikayumyum.com/2013/07/26/ready-set-spice-feast-of-eid/ and if you’re feeling a little nervous, take a look at the video clip before getting started here, https://www.youtube.com/watch?v=PXuhIfzGiR0…leave a comment….It would be great to hear from you! Back to the veggie breyani….this week on Mela, I will be featuring a Parda Veg Breyani…this breyani is also called ‘Dum Breyani’ which means its cooked in a pot sealed with dough so that all the flavours are ‘trapped’. 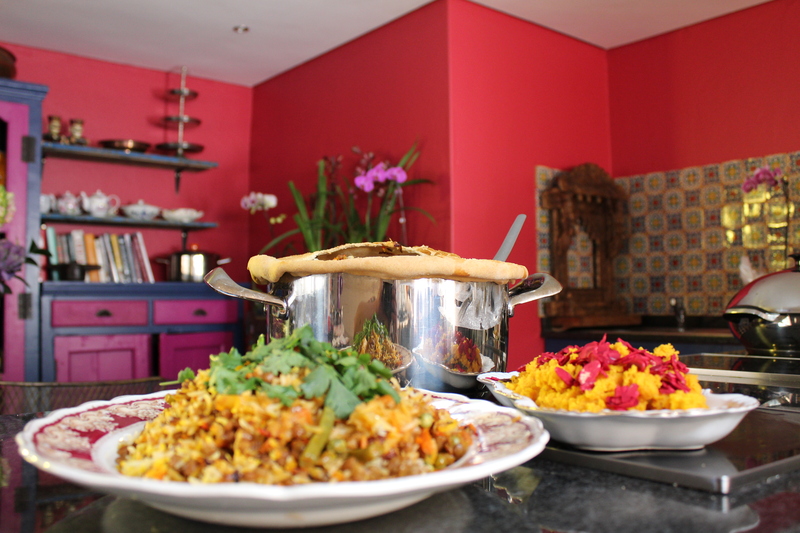 I always post Mela recipes on Sunday, but since SABC 2 are running a week behind schedule, I wouldn’t want to miss the opportunity to share this amazing recipe with you right now! It makes a change from the stove top breyani….for this recipe….get your AMC pot and mojo on! Haul out an AMC gourmet roaster….it goes from hob to oven to table…really, who needs extra washing up on Diwali! If you are hankering after an AMC gourmet pan, click here to enter the competition on my blog, https://yudhikayumyum.com/competition/amc-giveaway/. AMC cookware are also giving away one of their awesome pans on Mela’s twitter page so do take a look! Potatoes make a breyani so get down to your local veg store and ask for ‘Up to Date’ potatoes….no kidding ….it’s really called Up to Date! These potatoes are often the most expensive and are almost a floury variety that soak up the delicious flavours. Soft mushy potatoes are a must! Waxy potatoes won’t do for this recipe or any breyani recipe! Heat the sunflower oil in a AMC gourmet pot (with metal handles), add the cinnamon stick and bay leaf. Fry until the spices turn a shade darker, then add the cumin seeds. Once the seeds begin to splutter, stir the chopped onion into the oil and add salt. Saute until the onion is light golden brown then add the ginger and garlic. Add the red chilli powder and stir for a few seconds. Add the veggies, the remaining spices, and fresh cream. Stir well to coat the veggies in the creamy spice marinade. Layer half the brown lentils over the veggies, top with the par cooked rice, then scatter the remaining lentils on top of the rice. Slice the butter into little blocks and place them on top of the rice. Sprinkle the brown onion slices over the rice and the drizzle in the food colouring. Pour the water over the rice and set aside. Rub the butter into the flour until the mixture resembles crumbs. Add the sugar and water. Use a mixer with a dough hook attachment and work the dough until smooth – I used the KitchenAid Mixer for this! Roll the dough into a round large enough to cover the pot. Dab the edges of the round with water. Place the round over the pot and press the moistened edges firmly over the sides. Brush the dough with milk. Place the breyani in a preheated oven at 180°C and bake for 45 -60 minutes. The pastry should be golden brown and should sound hollow when tapped. Use a bread knife and cut through the dough to let out the steam – the steam can leave you with a nasty burn so take care when you are removing the dough. Gently toss the breyani and garnish with fresh coriander and curry leaves.